John: Well, many people would probably assume that if I am an Olympic Champion in my sport, it is probably the only thing I focus on. That is not true. I have a degree in civil engineering and I work as an Integrity Engineer for Lake Superior Consulting, LLC in Duluth, MN. I have worked there since 2012, all while training for both of my Olympic appearances. John: Olympic curlers are a little different than most other Olympians. Most of us have jobs of some sort, but not everyone. Only the top five, or so, teams are earning enough money to survive only by playing our sport. Another item that may be surprising is how down to earth most Olympians are. Many of us are just normal people doing extraordinary things in our sport of choice. John: I will try to make this story quick. Born in 1990, I played from age 8 to 13 in small bonspiels (tournaments) with my father and grandfather. At the age of 13, I began playing in Juniors with some friends. We played from 2003-2006. I attended Junior Curling camps in Wisconsin from 2005-2009 where I met juniors from other states; many of which are now lifelong friends. From there, I changed teams a few times and qualified for five-straight Junior National Championships. One “failure,” per say, would be that I was never able to win a Junior Nationals. That was always one of my goals. In the summer of 2011, I aged out of juniors at the age of 21. I was working back home in Mapleton and had been going to college at the University of Minnesota, Duluth for the last three years. 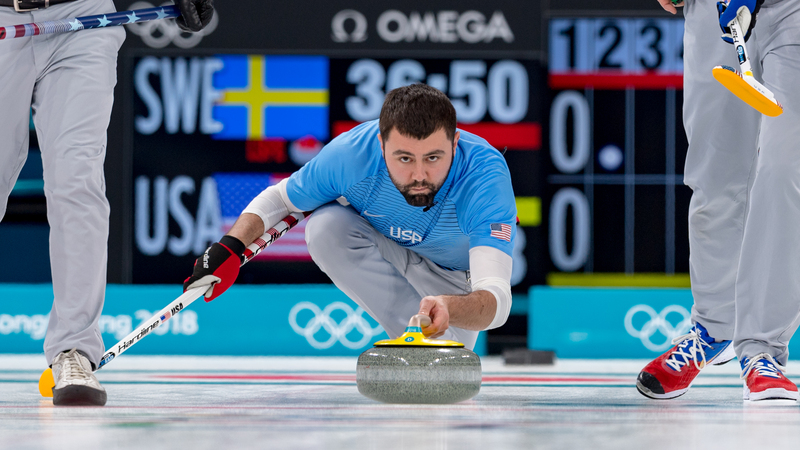 That summer, I received a call from John Shuster, asking me if I would like to join him on his team for the next Olympic quad. This was something I really had to think about, since I would be graduating college soon and starting a career. I chose to play. We struggled a bit on the ice throughout our first few years. We had no money. We would drive hours into Canada to get as many games in as we could. We won a couple of bronze medals at Men’s Nationals in those four years, but no major victories. But finally, in November of 2013, we won the Olympic Trials. One major challenge still remained, the United States had not qualified for a spot yet in Sochi. We were forced to play in a qualifier in Germany where the last two spots were determined for the 2014 Olympics. We made it through the qualifier after winning two or three in a row against Korea and Czech Republic, getting that second spot. All of a sudden we were done in Sochi. One of the biggest challenges I had faced by that time was dealing with finishing in ninth place, out of ten, in my first Olympics. It was my first experience being at an event that large, with that much attention. Nothing compares to representing the United States at the Olympics, and to have gone out there and done our best, but come up very short, it was a tough feeling. Two of our guys retired after that. John Shuster continued, and I tried to take some time off to focus on my career going into the 2014-2015 season. For the 2014-2015 season, USA Curling created a High-Performance Program (HPP) that neither Shuster nor I would be participating in. Shuster joined up with other non-HPP curlers and created their own team (not including myself, at the time). They battled for a few months, until I decided to accept the offer to come back. I couldn’t stand sitting at home, watching the scores on my computer, while I was stuck in the office for eight hours a day. From this point on, we worked as hard as we could and fought through many long weekends, where we would struggle with consistency on and off the ice. We were mentally and physically drained. We were away from family and friends for extended periods of time. We didn’t win a lot of bonspiels, just a few here and there. But in the 2017-2018 season, we won two events–the Olympic Trials and the 2018 Olympics. All our hard work for that four years was focused on those two tournaments, and the struggles we went through to get there had all paid off. We were Olympic Champions! John: Some of the best lessons you learn by getting there is how to be a great teammate. We worked incredibly hard on that as a foursome, and that was everything you saw coming together in our five-game winning streak in PyeongChang. We focused on being great teammates, and supporting each other, no matter what happened next. The reason I point this out is because being a teammate is something you need to excel at in all walks of life. For example, your spouse, family, co-workers or even the bowling team or softball league you play in. Teamwork is everywhere. John: An effective leader must adapt to their team. They need to understand the needs and the abilities of each person. They need to understand their weaknesses and find a way to help their teammates succeed so that the team can succeed. The thing is, this doesn’t have to be one person. It takes different kinds of leaders to make it all come together. John: Believe in yourself and your dreams. As a small-town kid from southern Minnesota, I never thought I would be on an Olympic podium, with a gold medal around my neck, singing the National Anthem. Learn to listen to your teammates/colleagues/family/friends and find a way to work together. Don’t give yourself any reason to look back on the past and have regrets. Give it all you’ve got. John: Go out there and be you. Play your best. Play your game. Success will come. John: If you find success, failure, setbacks or challenges in life and have found a way to achieve or beat them, share your story with others. Teach others how to get past the bad things and continue on to do great things. John: I really like to golf in my spare time; with my wife, family, or by myself. Golf makes you an honest person, as does curling. I love travelling now. I was never able to travel very far growing up. My junior curling career brought my entire family on our first-ever commercial airplane. It also brought my family out of the country for the first time ever. Since then, we have all travelled the world. Curling has shaped me from a shy, introverted young man, into someone who has the confidence to live life. John: I think this would be a great time to mention all the people that have been significant in my curling life, to this point. My wife, family, friends, my curling family, and of course my teams over the years. What a ride it has been and hopefully continues to be. In Korea, we had about 80 people in attendance just from our immediate families alone.